"Rare”… is a lonely word. When a child is given a diagnosis of a rare disease this affects the entire family. Not only does the child have special needs, but so does the entire family. Rare is isolating, lonely, and sad. In some cases rare is uncomfortable because others don’t understand. In our case, rare brought on child protective services because “nothing made sense”. This is how our family lived for years with our rare disorder called Pyridoxine Dependency. I remember searching books and medical journals to find info on this disorder. It validated, in just a tiny way, that perhaps I was not crazy. Reading the words “pyridoxine dependency” within the pages was a sure way to sell a book to me. Rare was isolating. I had no support from anyone because ”they had never heard of it”. I did the educating, even to the doctors and in some cases that was not socially acceptable. This was my child though, and it was my job to get her the best care that I could. At the time I had no idea that my constant battles with medical professionals would start to pay off. It started when I found an amazing neurologist from CHEO who would take on our child’s care. He was kind and understanding and validated my concerns. He then introduced us to the genetics team at CHEO. For the first time since our “rare” diagnosis we were treated with kindness and care. They really wanted to help and as the time went on we were invited to be a part of a study. I spoke to my daughter, who is now 11 about our journey and how we struggled to get the answers we needed for her and her sister. We talked about it being our turn to help the doctors help other families. The day my daughter offered blood, urine and a skin biopsy to the genetics team at CHEO was a very special day. Sienna eagerly let them cut into her arm for the biopsy and with a smile held up her sample that was destined to pave a much smoother road for other families who are dealing with a rare disorder like Pyridoxine Dependency. That was the day that the word “rare” took on a new meaning for our family. Rare was no longer isolating. “Rare” gave us unlimited tours in the research lab, special care from our team of doctors, and CHEO super hero capes for both Sienna and her service dog Jedi. Rare was now special. We no longer had to explain ourselves to doctors and we were no longer in a position where our care and attention to our daughter’s medical status was questioned. Rare now means strength and hope. “Rare” is no longer a lonely word. “Rare” is a special word that allows a family to celebrate differences and in our case, help other people. Thank you Care4Rare, when you care for rare you change entire families. When a child is born with four doctors in the room during the birth, there are certain expectations for that child that have already been formed. Quinlan was a high risk pregnancy due to observed delayed fetal growth. After birth, life threatening developmental issues were immediately evident. So began the life of a child with an as yet undiscovered rare disease. One of our first contacts after the NICU was with genetics and Dr. Boycott’s team. We never expected to need a geneticist, but the experience was warm and caring. Through careful questioning, we explored Quinlan’s initial diagnosis and pursued the tests for what seemed to be CHARGE Syndrome. When those tests came back negative, this prompted Dr. Boycott to submit Quinlan and parents to genetic sequencing to discover the true cause. This contributed to the discovery of an entirely new rare disease, Mandibulofacial Dysostosis with Microcephaly, or MFDM for short. We are deeply indebted to Dr. Boycott and her team for their time and care when dealing with such a sensitive situation. They provided essential guidance when evaluating Quinlan’s prognosis and future care plan as well not giving up on discovering the true cause of his condition. Our hearts would never have laid at ease not knowing the source of this condition or whether it could be passed on again in future children. About 5 months ago my family received the tremendous news my son Sam was accepted into the whole exome sequencing study put on by you wonderful people at Care for Rare. Sam deals with an undiagnosed form of ataxia making simple day-to-day tasks difficult but with all of your help we are given the gift of hope this holiday season. Thank you! As a small token of our appreciation, us Proctors are giving back by raising funds and awareness for the importance of rare disease research. At this point we have raised over 10,000 dollars. Our platform is simple; Sam struggles with the most basic movements so I plan to do the opposite. On December 29-January 1 at Across The Years ultramarathon I plan to break the Canadian 72 hour running record that’s stood since 1881 by running over 500 kilometers. The course is a one mile flat loop in Glendale AZ where I plan to run hard for 69 of the 72 hours, sleeping the other 3 in one hour increments. The effort put forth in these three days will be grueling but it pales in comparison to the efforts of your team’s drive to better the lives of children like Sam all across our country, and Sam’s steadfast determination to negotiate movement when it comes so very hard to him. I invite you to follow me along my progress over the New Year as we all approach the collective goal of discovery and understanding of rare disease. What a success!! 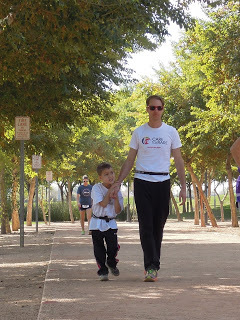 We raised $13,000 for Care for Rare and I stumbled upon the best running moments I've ever had even after realizing my race goal was well out of reach. My goal going into this race was a bloody lofty one, it was to break the Canadian 48 and 72 hour records. To do so I'd have to run over 500K but I felt this number was well within reach. My wife Sharon and brother Dan tag teamed crewing responsibilities which kept me rolling along, well fuelled and motivated along the way. In the middle of the night I surpassed the 100M mark in 16hrs35min. At this point I was right on pace and found the effort was that of a "controlled effort" much the same as marathon runners don't want to overextend themselves in the first 10K of the race. At 2:00am I found myself oddly sleepy so I decided to take an early one hour nap to get ahead of my sleep. This was the first time I had ever slept in an event and to be honest it went horribly. I was cold, legs were shaky, and my mind would not shut off! I spent the next hour half praying to fall asleep and the other half pissed off that I was wasting my time lying down when I could be out there running. When getting up from my nap I was alarmed by how quickly the running felt comfortable again and within 30-60 seconds I was back up to my regular 6 min/km pace. The rest of the morning went very well as I allowed the natural slope to continue eating away at my pace but at this point I wanted to run by feel permitting a forever pace with no effort expended. If the effort heightened, the pace decreased, its really that simple. The month prior to the race I was dealing with a minor left medial knee issue and as the first day came to a close I was content that the pain and discomfort stayed at bay, the niggle was there every step but never seemed to get worse throughout the day. Nine AM rolled around drawing a close to the first day and I was right on pace. Day one I ran 130 miles or 210K. My kids and parents showed up at 11:00am and that brought a beaming smile to my withering face. I really looked forward to making my way back after every loop to see their beautiful faces but an hour later my eye lids drooped and I felt I needed another nap since I got next to nothing for sleep the previous night. Again I roll into the tent for a one hour nap and like before it was another wasted mess of an hour stressing that my mind would not rest, thinking that slumber was a minute away but an hour passed and still no sleep. I knew this would all catch up with me sooner than later and as I left the tent I was red in the face knowing that I wasted yet another hour with nothing to show for it. The next 5 hours flew by running my new 6:30-7 min/km pace, fuelling very well and feeling in control. I couldn't wrap my head around the growing problem of sleep deprivation running and the unfortunate timing of finding out that this might be my new nemesis. Our friends and fellow runners Lisa Miller and Al Wong suggested I sleep in their EuroVan where it was warmer and quieter. At 5pm I laid my head for what I hoped would be a successful and much needed rest. I ran out from that van only an hour later wanting so bad to drop kick a palm tree;AGAIN I got no sleep! Filled to the brim with anger and anchored by disappointment I ran on. Around 8pm day two, 35 hours into the race I stopped for 5-10 seconds to grab some food. About 10 strides away from the tent I felt a nasty stab in my inner right knee. There was a building tightness the past 6-8 hours but I didn't think much of it, that is until it stopped me dead in my tracks. I walked back to the tent and immediately started rolling it out hoping it would help but knew it wouldn't. I made my way to the medical tent and already noticed the swelling building in in my knee. I laid down for one hour with my knee elevated with an ice compress. Sadly, now that it didn't really matter, I slept like a baby. I awoke an hour later and the inflammation was worse then before. Standing up, hardly able to bend my knee, knowing that the record was now out of grasp, Sharon, Dan and I drove back to the house to spend a night in a comfortable bed. I awoke the next morning with a big breakfast with the kids. To my surprise the feelings of disappointment didn't overwhelm me, in fact the joy of having all my family there was just what the doctor ordered. I spent time walking back and forth between the hot tub and the cold pool and that did the trick to knock off enough inflammation to get me excited to get back to the track to loop the course a few times with my family. You see, before when my goal was to break the record I was told I wasn't allowed to run/walk the course with my kids as they would act the part of a pacer thus disqualifying me. Now with the record out of hand pacing was fair game. When I returned to the course I slowly walked hand in hand with each of my kids, my parents, my brother, sister-in-law, and Sharon. After completing these laps both Sam and Julia wanted to do another loop and even with my knee aching how do you say no? We were like an army, all wearing our Care for Rare t-shirts all marching for the cause. My kids experiencing the sport that I love and gathering invaluable one-on-one experiences as we walked the course with all members of my family. Now those are memories worth holding on to. We left the course for dinner at the house and had some fun with the kids before putting the younger two down to bed. Afterwards my dad, brother, and I took to the hot tub. Once again the contrast bathing between the pool and hot tub did the trick and I felt like I could walk some more laps. My brother and dad informed me that I was still in first place and if I returned to the course and walked another hour or two that might just be enough to take home the win. To be honest I wasn't too motivated at this point to go after the win, my goal was to break the Canadian records and it seemed almost rude to all the strong runners still out there to go back to aimlessly walk a few extra miles to push the lead further out of there grasp. Before going back to the track Julia (age 9) urged me to go back and fight for first place and in fact she would walk with me every step if need be to get me there. With such persistence coming from a nine year old how could you possibly deny her of this opportunity. So at 10pm New Year's Eve we arrived at the course and I walked hand-in-hand with Julia. The clock struck midnight ringing in a new year. I celebrated with Sharon, Julia, and Dan and just kept on walking. My knee started buckling around 1am and that's when I called it quits. My total mileage was 202 miles. Thank you everyone at Care for Rare for your invaluable contribution in helping families like ours.